Time: 5 p.m. to 8:30 p.m. The Draft Environmental Impact Statement/Report (DEIS/R) has been released for a project that proposes to build bus rapid transit or light rail on a 9.2-mile route between the Orange Line’s Van Nuys Station and the Sylmar/San Fernando Metrolink station. The project — formally called the East San Fernando Valley Transit Corridor — would be built on or along Van Nuys Boulevard and San Fernando Road. The Executive Summary of the DEIS/R provides a good overview of the project and is embedded above. The entire document can be viewed and downloaded by clicking here. •Curb-running bus rapid transit with the bus lanes would be located next to the sidewalk. 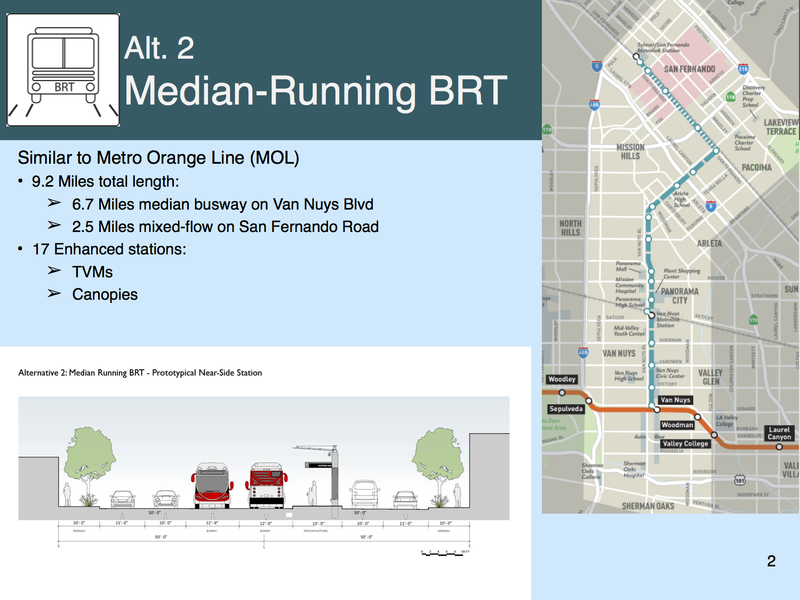 •Median-running bus rapid transit — the buses would run in exclusive bus lanes in the middle of Van Nuys Boulevard. •A median-running light rail with 28 station stops that would consolidate all bus service into the median running train stations. 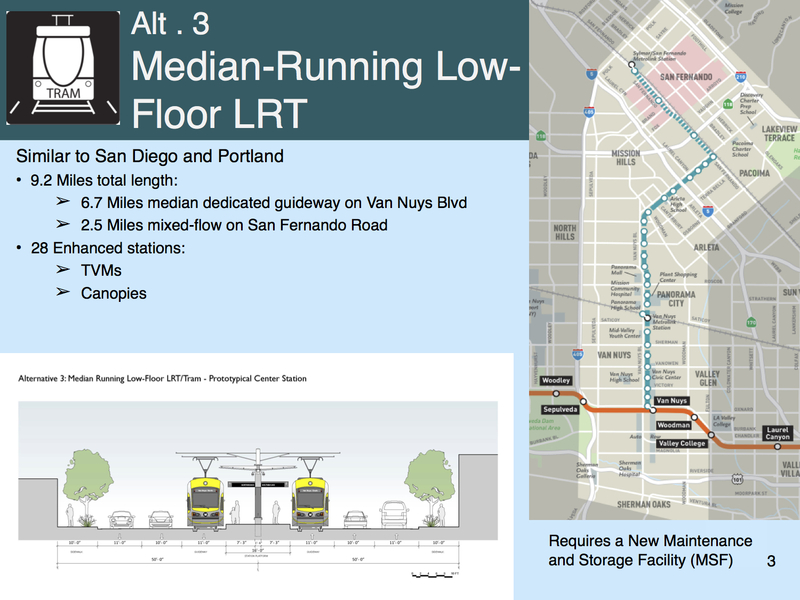 •A median-running light rail with 14 station stops that would preserve existing local bus stops with curb-side bus stops along the entire route. •Options for light rail would include the selection of one of three potential rail yard maintenance sites. Light rail could also include a potential subway section between Sherman Way and Roscoe Boulevard. 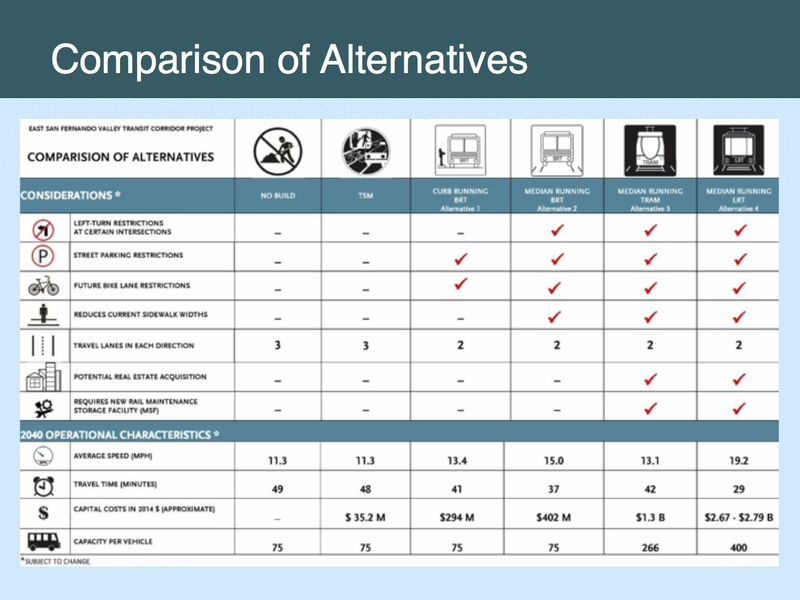 This chart from the DEIS/R sums up the different alternatives. Metro is legally-required to study the ‘no build’ option and the ‘TSM’ alternative means traffic signal and road improvements. As the DEIS/R notes, Van Nuys Boulevard is the seventh busiest corridor in the Metro Bus system with service provided by the Rapid 761 and Local 233. Those two lines together have the second most boardings in the San Fernando Valley behind only the Orange Line. The busiest stretches ridership-wise for the 761 and 233 are between the Orange Line and Panorama City. This project was originally part of the Measure R sales tax approved by L.A. County voters in 2008. Initially, the plan was to build bus lanes on a major north-south street or streets on the east side of the Valley. But stakeholders and community members asked Metro for a more robust transit project with more speed and capacity. Measure M is adding $810.5 million in funding to the existing $520 million available from Measure R and other sources for a total of $1.33 billion. The Measure M expenditure plan has the project breaking ground in 2021. •Another project with funding from Measures R and M is the Sepulveda Pass Transit Corridor. A technical study for that project is ramping up and will begin the process of determining what form of transit is used to connect the Valley to the Westside. As part of picking the preferred alternative for this project, Metro staff and Board will consider the best way to connect the East San Fernando Valley Transit Corridor with the Sepulveda Pass Transit Corridor. 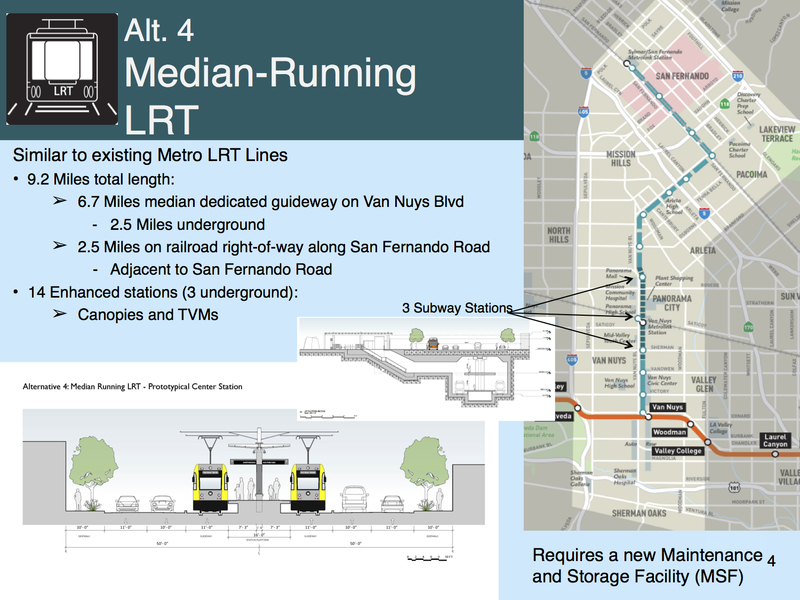 •The light rail alternative in this project — with a 2.5-mile section of subway under Van Nuys Boulevard — carries an estimated cost of $2.67 to $2.79 billion, according to the DEIS/R. It is possible that Metro could reconfigure the light rail alternative so that it costs less, an important consideration since there is $1.33 billion available for this project. •This project will also intersect with Metrolink’s Ventura Line at the Van Nuys Station and Metrolink’s Antelope Valley Line at the Sylmar/San Fernando Station, as well as the future North San Fernando Valley Bus Rapid Transit (BRT) project that was part of Measure M. That project will provide an east-west bus rapid transit line across the northern Valley. The study area includes Northridge, Panorama City, Sun Valley, Pacoima, Sylmar, North Hollywood and San Fernando. Van Nuys Boulevard looking north from Victory Boulevard. Photos by Steve Hymon/Metro. New development on Van Nuys Blvd. in Van Nuys. Looking north on Van Nuys Boulevard in Panorama City. A satellite view of development around the San Fernando Road south of the Sylmar/San Fernando Metrolink Station, which is at top left. Credit: Google Maps. ● Thursday, Sept. 14, 2017 (6 p.m. to 8 p.m.) City of San Fernando Regional Pool Facility, 208 Park Ave., San Fernando 91340 (This meeting will be live-streamed at ustream.tv/channel/eastsfv). ● Monday, Sept. 18, 2017 (8:30 a.m. to 11 a.m.) Zev Yaroslavsky Family Support Center, 7555 Van Nuys Blvd, Van Nuys 91405. ● Monday, Sept. 18, 2017 (5 p.m. to 8 p.m.) Valley Municipal Building, Council Chambers, 14410 Sylvan St., 2nd floor, Van Nuys 91401. ● Wednesday, Sept. 20, 2017 (9 a.m. to 11:30 a.m.) Pacoima Charter Elementary School Auditorium, 11016 Norris Ave., Pacoima 91331. ● Saturday, Sept. 23, 2017 (9 a.m. to noon) St. Mark’s Episcopal Church, 14646 Sherman Way, Van Nuys 91405. Comments on the draft study can be emailed to eastsfvtransit@metro.net or left on the project hotline at 818.276.3233. All comments must be received by 11:59 p.m. on Oct. 30. How does this study relate to the Sepulveda Pass corridor, like for example, providing through service? I notice the lines as mapped don’t reach down to Van Nuys & Ventura, where tunnel proposals usually terminate. Or are the San Fernando and Sepulveda Pass areas considered completely independent problems with independent solutions? As the post says, this project will work with the Sepulveda Pass project to figure out how to link the two. This project won’t go south of Orange Line — that’s important to understand. I don’t think they are being treated as independent problems. Rather, two separate projects with work to be done to figure out how to link the two. A big part of that is figuring out what is best to build between Orange Line and Sylmar/San Fernando. The segments north and south of the Orange Line MUST use the same vehicles in order to provide one-seat service. The sure way to limit future ridership is to force an end-to-end transfer. Even if the Orange Line is not converted to rail, it makes sense to employ the same technology on both lines to allow through service. Again, transfers inevitably result in lower ridership. As for the Orange Line, it should have been a rail line from Day 1. However, I feel that the money that would be spent converting it to rail could be better spent on additional service in the valley, such as extending the Red Line via an elevated structure to San Fernando. The effect of unnecessary transfers on ridership must be factored in. I’d be interested in seeing the tram option with fewer stations. In some places it seems like it’s almost stopping every block. Maybe cutting a few stops would get it a little closer to LRT’s travel time without the added costs. You state this is the seventh busiest corridor in the MTA system, what are one thru six? Not sure of the precise order but Wilshire is definitely #1 closely followed by Vermont, Normandie and Western in some order. The Metro fantasy renderings leave out a major element of the streetscape which Santa Moncia learned the hard way with Expo: fences to keep the pedestrians in their place. The gentle renderings of a docile community living in symbiosis with light rail is nonsense. The fact is the folks who live and work along the right of way are about the see their streets lined with 4.5′ (in some sites taller) cages. And wait until they get a load of the crossing bells blaring at 85dB at 6 minute intervals every 24 hours. They have no idea what they’re in for. Right, let’s just stick with the noise of drivers honking their horns (85dB-110dB), the smell of exhaust from idling cars in traffic, and the obscene amount of hit-and-runs that LA is notorious for. But I get what you’re saying. Why don’t we juxtapose real photos from our existing LRT lines to help us visualize what it would look like on Van Nuys instead of recycling these renderings? With speed being one of the goals of the project, that would definitely rule out the trolley option (and maybe even the curb BRT). Center LRT or BRT seem the logical choices. However, could the cost of either center option = doing curb BRT on both Van Nuys and a parallel street (Sepulveda or Laurel Canyon)? Sepulveda Pass is generally assumed to be heavy rail. If cost were no option, replace Orange line (from NoHo to Van Nuys) with Red line extension which interlines with Sepulveda Pass HRT. 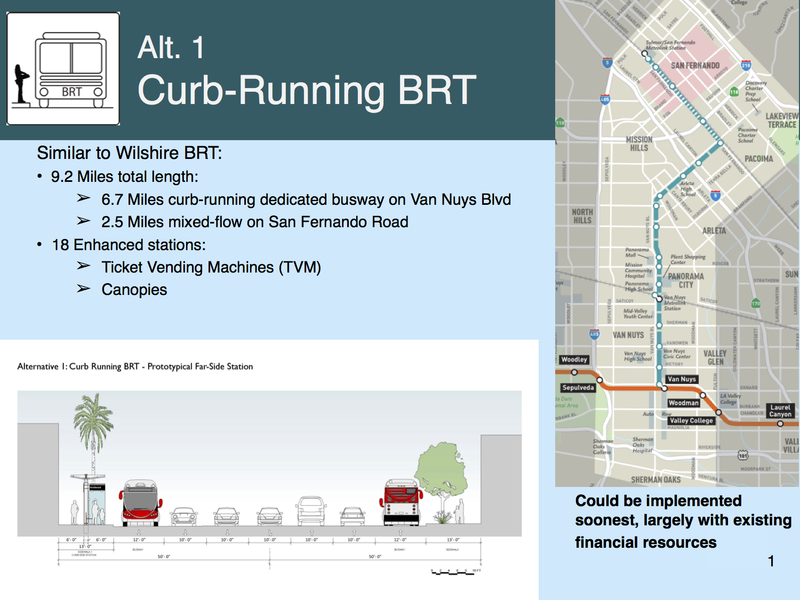 Orange (west of Van Nuys) and San Fernando corridor would be one long Center running BRT. It took Metro YEARS to finish the report. Why? 1. One seat ride with the Sepulveda pass project into West LA. Anything else is ridiculous. 2. There are 2 Metrolink Stations that can provide ridership from Ventura County and Northern LA County cities like Palmdale. Why waste an opportunity to provide an easy transfer and give those people another opportunity to give up their cars and get into West LA. 3. The LRT is estimated to be under 30 minutes end to end, much faster than any other options which rely on traffic signals and buses or a Tram stuck in traffic. 4. Ridership is expected to be in excess of 60 Thousand and far exceed any other mode. Don’t be foolish Metro, choose LRT and do it right the first time from the start. One reason for the holdup was waiting to see what would happen with Measure M and whether this project would have more funding. Measure M added $810.5 million to the funding pot for this — no small amount of money and an important consideration when weighing the different alternatives. Hey Steve, question for you if you don’t mind; When does Metro staff next report back to the board with an update on the southern Vermont Avenue subway? I recall a motion was recently filed requesting staff study a subway extension from Wilshire to at least as far south as Exposition, but I’m not clear on when the public gets an update on the matter. While the low-floor tram option may be cheaper than light rail, the substantially lower passenger capacity should be a red flag. Ridership would likely become high enough during rush hour to warrant LRT. Forgot to add earlier – the LRT option wouldn’t require a different type of rail car than your current stock. That might make maintenance a whole lot easier (and possibly cheaper). Ridership is so low on Option 3 because they’ve added a ridiculous amount of stops. This lesson should be applied liberally to every bus line we’ve got. “more robust transit project with more speed… ” …. come on, Metro, how about signal priority so trains with hundreds of people don’t stop for lights. Sure as a phase I, let them build it as a surface bus (BRT) line. However the line from the Orange bus line to LAX should be started within a few years of the Sylmar Van Nuys bus line. Construction should start more like 2022 and be completed by 2025 not 2057. I feel that the Van Nuys LAX Service (Sepulveda Corridor) should be built to full metro Standards. An LRT line as envisioned would not have the capacity needed. The cost for a full Metro is not that much greater other than building the stations for 6 or 10 car trains Vs 3 cars for LRT service. There sure is no need to build additional bus HOV lanes on the 405. A billion dollars two years back added HOV lanes with no improvement is traffic speed. After the Van Nuys LAX line is complete, then this heavy rail line can be extended to upgrade the bus line from Van Nuys to Sylmar. There no doubt will be enough need for full BRT bus service and a Heavy Rail Subway along Van Nuys as there is along Wilshire. This will also give passengers traveling on the HSR from the north a direct fast connection at Sylmar to LAX. I agree heavy rail would be best if there’s enough money on the table to do it without adversely affecting other important rail projects, but I don’t think high-speed rail is planning a station in Sylmar. If I’m not mistaken, HSR trains will be going from Palmdale straight to Burbank. Bus lines are actually 233, 744, and 788. I’d like to see this become a single, continuous heavy rail line from San Fernando to LAX. That’d be the fastest route and likely entice the highest ridership. Vermont Ave from Wilshire to the Green line should be heavy rail as well, since we have the money for it. It appears that there isn’t enough money to build LRT as it should eventually be (linking into Sepulveda Corridor as a one-seat ride), so in lieu of that the curbside appears to be a reasonable option for the time being. It could be used to grow ridership and encourage TOD along the corridor until the Sepulveda Corridor comes along, and could be converted to LRT then. Not a fan of the low-floor LRT. Those just encourage passengers to walk in the right-of-way and get run over. It is also probably better to make the type of LRT vehicle uniform so maintenance is easier. Couldn’t starting with BRT and kicking the can down the road on rail cost more in the long run, though? Building the Orange Line as rail to begin with would have been cheaper than building BRT, removing it and then finally building rail. As much as I would like to see one mode/one seat ride from Sylmar, through Van Nuys, through the Sepuveda Pass and down to LAX, we have to think that only the segment from Orange Line/Van Nuys south to LAX warrants a subway. North end of the route, especially towards the San Fernando end does not need subway, light rail should be sufficient. Subway should come north to Orange Line, at which you have transfers west on the Orange towards Chatsworth , East towards NoHo and North towards San Fernando. The Van Nuys Orange Line station needs to be upgraded to a major transfer station and later on , the Orange Line itself, turned into light light. 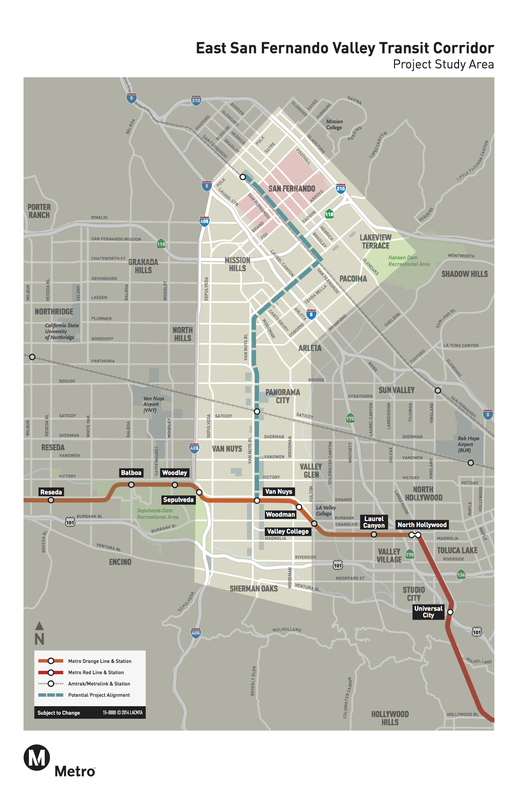 You could have the existing Orange go from Chatsworth to NoHo and then the new segment from San Fernando could also turn onto the Orange LIne to NoHo. This provides greater amount of service from Van Nuys to NoHo . That last suggestion is a great point! Why doesn’t Metro design their BRT projects to take advantage of the flexibility that BRT offers to run multiple branches from each trunk line? I’m almost positive there won’t be any Subway options South of Orange Line. The same argument for BRT applies here. This line, the UCLA to Valley, and UCLA to LAX sections needs to be light rail only for all the other pieces of the puzzle to fit. Building one segment as a different mode from another one just adds fragmentation and this is exactly what the complaints are about. So if it’s BRT north of the Orange Line, then BRT should be applied south of the Orange Line as well. Enough with the forced transfers, if the money isn’t there, then don’t build it until it is. It’s better to wait for something to be done right than to compromise. The money’s there I think, at least for continuous LRT from Sylmar to LAX, which seems to be the most likely option when all factors are taken into account. Yeah, needs to use same LRT stock as Expo, Gold, Blue and Orange needs to be upgraded to same. Especially if this project won’t go south of Orange. I’m not a big fan of transfers myself, but 7MC makes it as close to painless as it can. Hopefully we set a similar multi-modal arrangement where HRT from Sepulveda arrives at the Orange Line cross. Then someday the Sepulveda heavy rail and take a different path to Sylmar or connect with Red at the Burbank airport. This transit line expected to be operational by the year 2040. The Measure M expenditure plan has the project breaking ground in 2021.. Is it going to take 19 yrs to build this line or does this estimated time include the Sepulveda Pass project? No, I think this corridor is supposed to be operational by 2027. The 2040 “Horizon Year” is used to plan for a more mature system so that they don’t under-design. I tried looking through the Executive Summary and parts of the full DEIS/R, but I didn’t find anything on cost-effectiveness. Don’t they usually provide estimates for each alternative based on the costs and projected benefits? If not in the DEIS/R, then does Metro provide these at some point later? After just an hour of skimming and reading, I think I begin to see how incredibly complicated this all is. But I would like to see some kind of direct comparison between the LRT and BRT to see if the increased speed and capacity of the former makes up for its much higher costs and construction time. There is only 6 Billion dollars for the Sepulveda Pass project and a complete build out of West LA is closer to 40 years in future. Since the sepulveda line will be 100% subterranean from aviation /96th to the orange line, building LRT makes no sense because the costs are approximately the same as building HRT. In other words to build LRT through the pass is buying a lot less transit for the same massive amount ofmoney. Should the decisions of a 2 billion LRT dictate the decisions of a 12 billion rail project ? Apropos of nothing, the Barcelona line 9 solution is an excellent option for the sepulveda line to lower costs and increase the construction schedule. There is also the capacity problem of the van nuys line being at grade for almost the entire length. You can’t go below four minute headways since the trains are stuck in traffic on the surface street at traffic lights same as the buses. The whole line is basically like the flower street segment of the expo line. If you try to go faster than four minute headways, the traffic light constrained trains bunch like orange line buses, which ripple problems throughout the line. But at 4 minute headways, 15 trains per hour, 400 people per train LRT only transports 6000 people per hour (each direction). That is not enough for the sepulveda pass–the project would exceed demand for such a corridor before it was even built!. HRT is the only thing that will provide enough capacity for the bottleneck. Unfortunately, that means no single seat ride to west LA. The needs of the entire valley outweigh the needs of the van nuys corridor, in this instance. I noticed the same thing. The cost effectiveness calculation is used for projects that are trying to collect funding from the federal government (FTA). I didn’t see mention of ant New Starts funding in Chapter 6, so maybe that’s why they didn’t report the cost effectiveness numbers. If they had reported the cost effectiveness, the Tram alternative would have rated very badly because O&M costs for that mode are so much higher than for LRT, which is very strange because the Tram alternative eliminates the need for local bus service (Route 233) along the corridor. Five Public Hearings are set by MTA for the east SFV corridor starting Sept 14th thru 23rd, along the route. The Sierra Club supports the LRT, Alternative 4 with 14 stations, (3 underground). Please write your comment letters before the October 15th deadline letting the MTA know what we individual stakeholders prefer and how we would use the new line. I prefer light rail because of it’s ability to increase capacity, and the speed of 29 minutes as opposed to about 40 for the other three “build” alternatives. I also believe a faster and more reliable service is the only way to get me and others like me, who drive, out of their cars, and that is the only way to improve air quality over time. Our business is in an area that has been designated for full take. Seems like a lot of us have only found out about this project in the last week. What I want to find out from metro is how they decided on taking the area from Kester Oxnard all the way up to Calvert and essentially wiping out well over 120 businesses that deal in a wide variety of manufacturing ? Our area has developed a strong community spirit where we have tried very hard to maintain a clean safe work environment. Not an easy task when you consider all the ill’s associated with these types of areas. The other area that is option 2 for full take borders from Kester and Raymer ave and proceed to take land away from again yet another group of people that rely on M1-M2 zoning. It strikes me as odd as to why they wouldn’t take the 15 acre parcel just to the right of the existing Metrolink station at Van Nuys Blvd and do a partial take of Coparts. It seems that by using eminent domain on two parties as opposed to hundreds of business owners who provide work to thousands of people that live in the area. I’m all for the progress of moving people from point A to B as efficient as possible but when it hits this close to home it leaves me to believe that they haven’t considered all the more cost effective options. The Properties I speak of are 7600 Tyrone Ave. A 15 acre empty parcel of dirt for the last 20 years owned by a big pharmaceutical company. and 7519 Woodman which is a huge auto auction site. The parcels are adjacent to existing rail. I just wanted to share my end of the spectrum and give you perspectives into what a lot of scared business owners are facing.